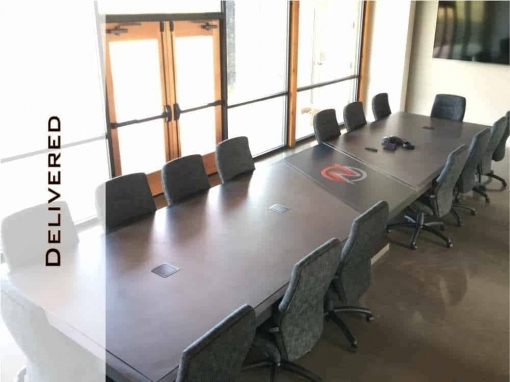 Found Derek after hours of searching the internet for something that captured a vague idea in our heads about what we wanted our conference table to look like. Initially we asked for a design that we would construct, but as the process evolved we knew that we couldn't give the design justice on our end and asked him to build the table... I could go on about his customer service and attention to detail but with brevity in mind will say that we couldn't of been happier with the end result. You will definitely get a best value right down to the fine details. If you are looking for a one of a kind product with exceptional quality you will not be disappointed. Working with Darek was great. He totally understood what we were looking for in the design of our matching Baordroom table and coffee table for our Head Office renovation and worked well with our suggestions to create unique pieces that we and everyone that comes into our office loves!! Definitely would recommend him and use his talent for design again. Darek at Designs by Rudy did an incredible job all through the process. The design, build and shipping phases all went according to plan. The bench turned out beautiful!!. We are so happy. He steered us through the design process and came up with an incredible design.... You will not be disappointed. The concrete tables I purchased are exactly what I wanted--modern, unique and stunning. Darek, the owner, was very helpful, and kept me informed throughout the process of fabrication. He exceeded his promises and I am extremely satisfied with the product and service. Just wanted to say how impressed we are with the work of Designs by Rudy. A couple of days ago we received a crate containing our concrete coffee table. The fabrication and shipping to France took a while but the design and quality is amazing, it was totally worth the waiting.... It was a very pleasant experience buying from Rudy. Made me a beautiful table exactly to my specifications. Gave me updates throughout the entire process. Very professional. Highly recommend. Can’t wait for my next purchase!!! 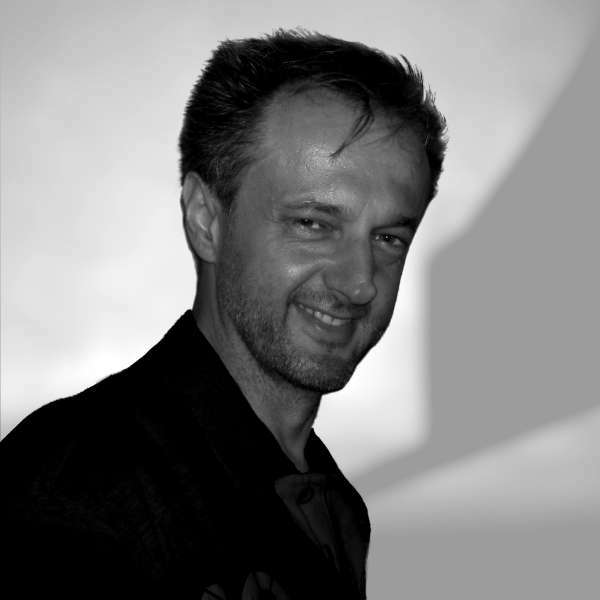 I am the designer and creator behind Designs by Rudy, a custom concrete furniture studio in the Chicagoland area. I specialize in designing and building concrete conference tables, coffee tables, consoles, benches, side tables, and smaller concrete accent pieces. My portfolio includes many designs that are a perfect fit in any indoor or outdoor space. To truly bring out the best in a particular environment, I work with clients to design custom furniture that meets their exact needs. 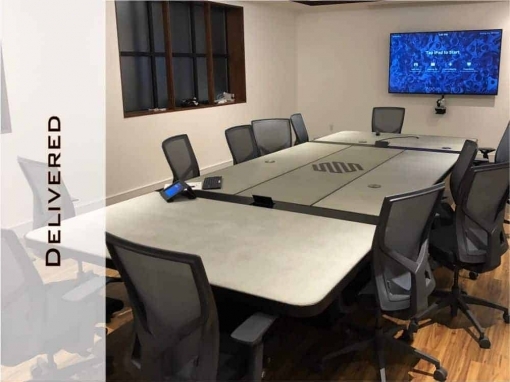 Whether it’s a concrete conference table that incorporates a company’s logo and elements that define their brand, or a complete patio set that perfectly complements its surroundings, I can bring any vision to life. Take a look around my website. If you like what you see, give me a call and we can talk about any ideas or projects you may have – no matter how unusual! Please fill out the form below or give me a call at (847) 281-5131 to get things started. 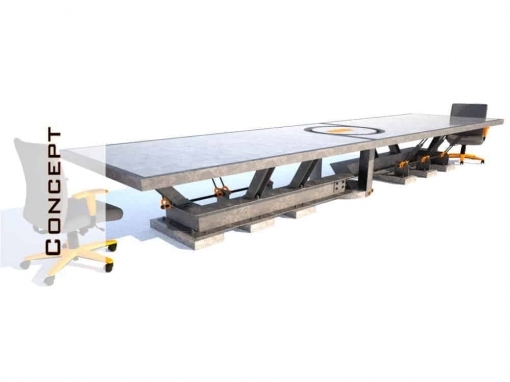 Fabrication of household concrete furniture was first introduced in the early 1900s. This new concept, however, has not gained popular support among the general public as concrete was then viewed as ugly and unappealing. Moreover, the use of concrete has only been associated with the construction of roads and bridges and was thought to be an unlikely material for the creation of furniture and other household fixtures. At that time, even the use of concrete in building houses were deemed to be unattractive and impractical. Advocates of the new concept were also unable to prove the reliability of the material and its many uses. 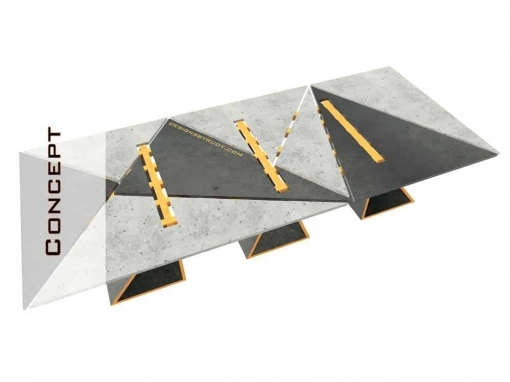 It took several decades before advocates of the use of concrete in building houses and creating concrete furniture were able to develop mechanisms as well as equipment that will allow concrete to be used for creating highly durable and resilient concrete products. When these methods were developed, the usual rough and stiff material has been transformed into a more pliable and soft substance that is capable of being designed and molded into various forms and sizes. 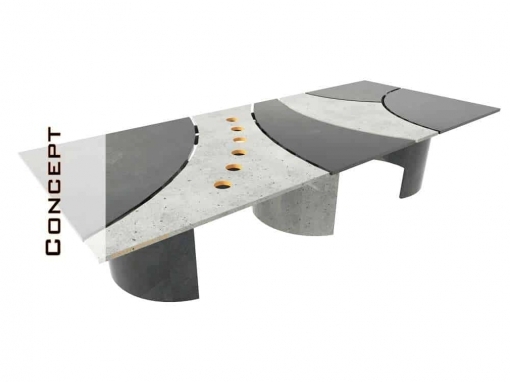 Concrete tables were among the first forms of concrete furniture created, made for their functionality and for style. Early forms of concrete tables only featured giant slabs of rectangular concrete. 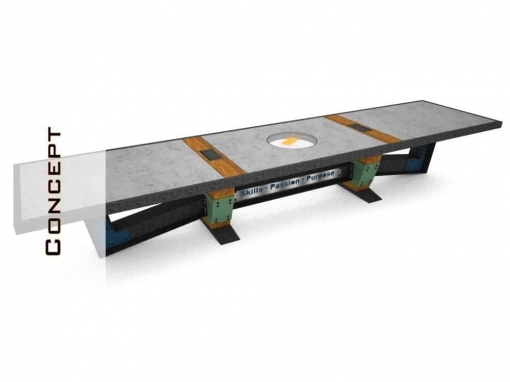 Decades of innovations and development of new materials that can be used for concrete mold building have allowed concrete to be shaped easily, creating variety of often bizarrely fashioned table tops. There are two kinds of concrete furniture available in the market today. The first one is precast concrete furniture. These pieces are mass-produced from a single mold. 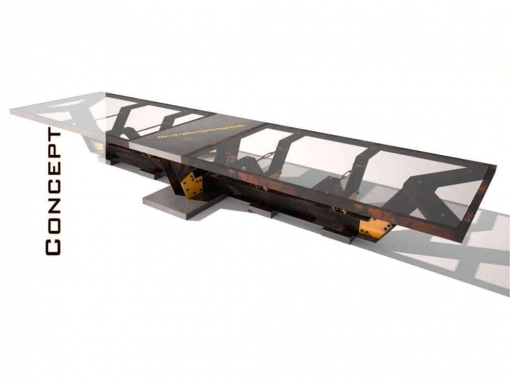 They can be usually purchased at a much lower price than its counterparts, custom concrete furniture, and are readily available to the buyers depending on the availability of stock. The other type of concrete furniture is the custom design one. Customized tables, benches, chairs, buffets, etc. are made according to the wishes and specifications of the buyer. They are unique, one-of-a-kind products that are only sold to the one who ordered them. One advantage of having such furniture is that they can be highly personalized, including special shape, business logo or message embedded into the concrete, and so on. These kinds of concrete designs, however, are usually much more expensive and take a longer time to be finished and delivered. The most common material used for concrete furniture mold building is Melamine sheet. It’s available in every larger home improvement store or lumber yard, inexpensive, and provides perfectly smooth surface. That means that a piece of concrete furniture pulled from such mold will also be smooth and will not require significant amount of finishing work. The negative aspect of using Melamine for concrete furniture molds is that, in most cases, the mold cannot be re-used. 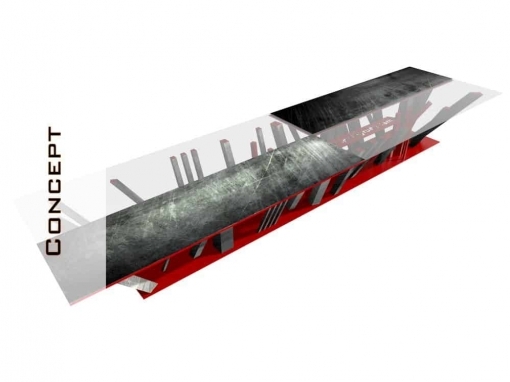 Technically it can, but being an inexpensive material, Melamine’s coating will be affected by moisture and heat generated by concrete during its initial curing process inside the mold. Melamine’s mold surface usually becomes more or less uneven, sometimes warps slightly, and loses its sheen. All that will affect the concrete surface if the same mold is used for another pour. It may not look that bad but it all depends on your expectations, sometimes reusing old molds creates interesting patterns and texture on the concrete surface. Using much more expensive and high quality Formica sheet to build a mold will overcome this problem, especially if planning to make several concrete pours of the same piece. 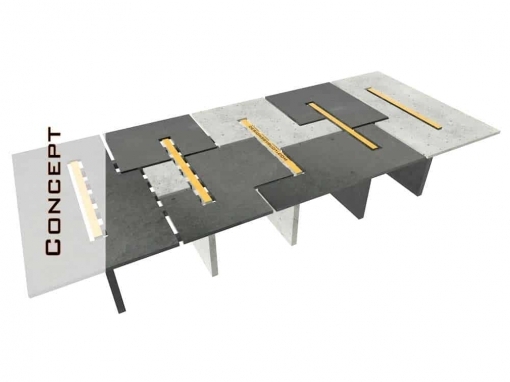 However, depending on the design of a particular concrete furniture piece, the more complicated it is, the more likely its mold will not be reusable anyway. There are various types of concrete furniture and while many are great for both indoor and outdoor areas, some, depending on their design and structure, will require extra protection from elements. For example, a concrete table looks great when used for outdoor dining. It easily blends well with all the natural elements. It is also highly durable and capable of resisting all types of weather. It is able to endure the high temperatures of direct sun as well as extreme cold. It also does not get damaged even when exposed to rain and hail. 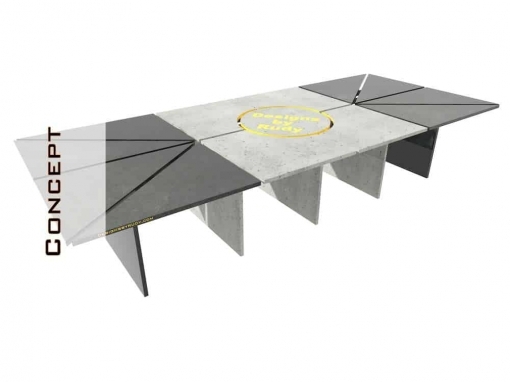 Thus, for outdoor settings, one is able to avoid the inconvenience and the trouble of having to drag outdoor tables when sudden weather changes occur. However, to preserve table’s finish, the sealer will need to be re-applied periodically. Concrete furniture generally blend well with other themes and decorative implements. Thus, they can be also used for indoor dining and decorating purposes. Concrete dining tables are sturdy and are easy to clean and sanitize. Moreover, they are a great conversation starter at any party. 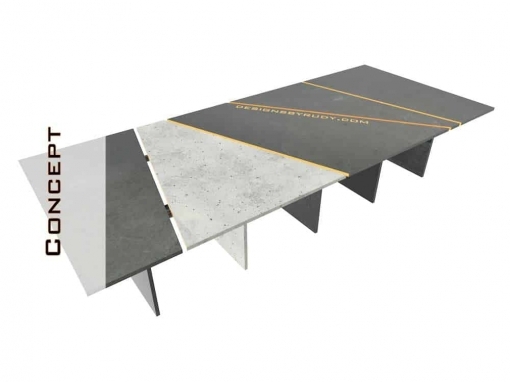 Since modern concrete tables are designed in different shapes and forms, smaller square or rectangular ones can be used as side or coffee tables, long and narrow concrete console tables may serve as decorative objects in the hallways, narrow passages, or behind a sofa. Concrete furniture also make a great addition to the décor of businesses and offices. 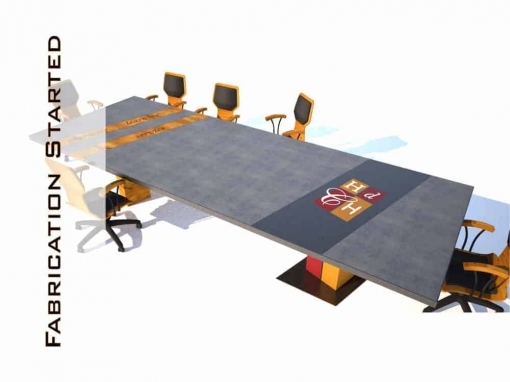 They are often used as boardroom – conference tables, waiting tables for reception areas, and display tables for certain businesses. 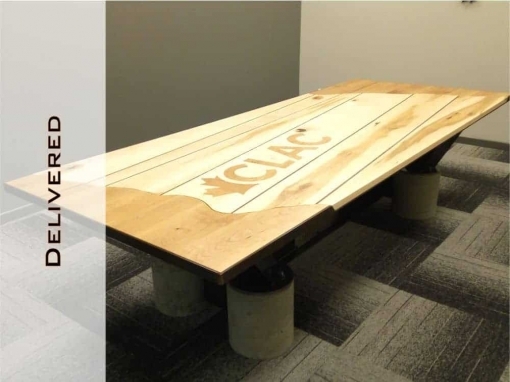 Businesses sometimes purchase customized concrete tables to create a more unique look or to complement the existing design scheme that they have. 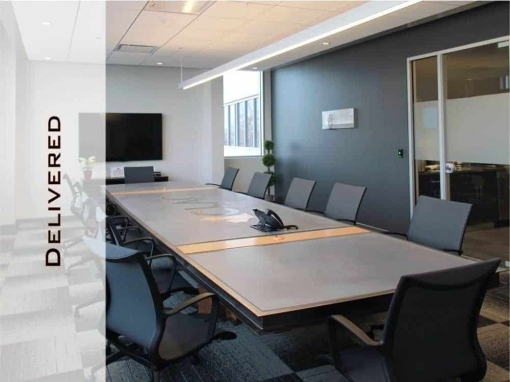 Many businesses employ a sleek industrial look for their offices and having concrete tables greatly accentuates that theme. Restaurants and cafes, especially those which follow a more modern and relaxed theme, will also find the use of concrete furniture to be highly advantageous. First, they get value for their money. These tables are extremely durable so they are made to last even when heavily used on a daily basis. Second, it is a great decorative piece of furniture. It is able to combine aesthetic appeal and sheer functionality. It can also be transformed into a stunning centerpiece and buffet area. Its uses are endless and its charm is limitless. The concrete tables also work well with cafes and diners which offer al fresco dining. Concrete blends well with other outdoor elements and it serves as a striking invitation to passersby who will most likely be intrigued by the decorative effect of concrete tables. Moreover, care and maintenance is relatively easy since concrete tables are virtually indestructible and require minimal upkeep. As mentioned earlier, concrete furniture are highly suitable for outdoor dining for their ability to withstand changes in weather. 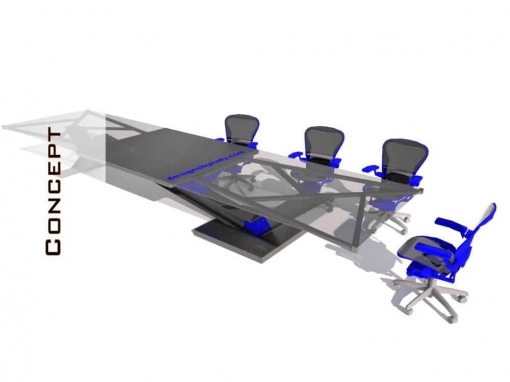 This makes them highly cost-efficient and versatile, also, business managers will not have to go through the hassle of frequently replacing broken furniture. Modern concrete furniture designs are quite versatile and they come in various shapes, sizes and also have multiple functions. It is now common to have concrete kitchen countertops and sinks. Recent additions to these kitchen novelties are concrete cabinets, dining tables and chairs, which may be customized based on the form, size and color preferences of the user. Concrete countertops may either be precast, where they are casted off site based on the template chosen by the client, or site casted where the concrete is poured, cured, and finished right on top of the kitchen cabinets. A lot of people are now interested in transitioning to concrete countertops because of its tried and tested durability. Customization ability also plays very important role. Therefore, certain details that the client wishes to incorporate into the design may easily be added before it is cast and cured. Moreover, due to constant advances in technology, concrete materials may now be stained, coated and infused with certain additives to attain even more customized design. Dining tables and chairs, coffee tables, bar stools and other seating implements are also common concrete furniture designs. These designs range from a block-like structures that are commonly associated with concrete furniture appeal to the soft and fluid look of more contemporary designs. Furniture designers have also now ventured into making rocking chairs and several decorative pieces like statues, decorative panels for walls, floor tiles, planters, and home ornaments from concrete. Concrete furniture designs can also be easily customized according to the color preference of the client. Coloring concrete pieces can be done in several ways with varying results. One process is done with the use of an internal pigment. This is a colored powder or liquid which is mixed into the wet concrete and allowed to set with the entire fixture. This process completely and permanently colors the entire concrete piece. This process is also more predictable in the sense that the client is able to choose the very close color outcome of the process. Another process of coloring concrete projects is acid staining. This process involves infusing metallic salts on the hardened concrete and allowing it to react with the material. This also results to a permanent color but the exact outcome may vary per project. Putting dye on the concrete slab is another coloring process that may be used. The dye is applied to cured slabs. This process only allows color to penetrate the top layer of the concrete. The designer may create various patterns with the dye but there are limited color choices and some dyes may not be suitable for all concrete surfaces. 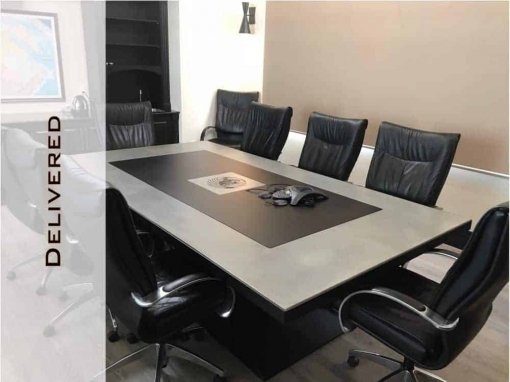 Maintaining the quality of concrete furniture depends greatly on the kind of concrete used, the the additives that are used in its mix, and the furniture piece application. It is important to note that while concrete is durable and practically indestructible, some additives, colors, and sealants are not. Many of these materials will show signs of wear and eventually alter the overall appearance of a particular piece of concrete furniture. Thus, it is best to be well-informed of the possible outcome before it is too late. Concrete furniture used on exterior or concrete surfaces used for serving or having contact with food are the most demanding when it comes to sealer application and its type. There are sealers and waxes specifically designed / rated for the concrete surfaces that will have contact with food and only those should be used in such applications. Depending on the sealer type used, periodic re-application will be necessary to prevent food staining and penetration of concrete surface cracks and pores. This is critical when maintaining kitchen concrete countertops. Exterior usage also demands extra sealer coatings and their re-application every once in a while. Despite the durability of concrete and its resistance to abuse, temperature variations, humidity, sun, rain, and snow will eventually start grinding it and changing its appeal. Remember to keep concrete furniture clean, removing staining agents as soon as possible, and when you notice that their surface starts absorbing water, re-coat it with sealer following its manufacturer application procedures. Interior home decorating has never been the same with the emergence of a wide array of options associated with concrete furniture design possibilities – they are truly endless, limited only by the imagination of the concrete furniture designer. I never outsource my furniture designs. I will never sell or share your information.